LAS VEGAS (AP) — A public airing of information about the death of an unarmed 40-year-old man at the hands of a Las Vegas police officer last year failed to satisfy the man’s mother, who sobbed Monday through descriptions of her son’s autopsy and later called the proceeding a cover-up of a criminal act. “They’re not being fair to Tashii. It’s like they put him on trial,” Trinita Farmer said following the nearly three-hour non-judicial hearing about the May 2017 death of her son, Tashii Farmer Brown, outside a Las Vegas Strip resort. The former police officer, Kenneth Lopera, who was dismissed from the department last September, did not appear for the proceeding. 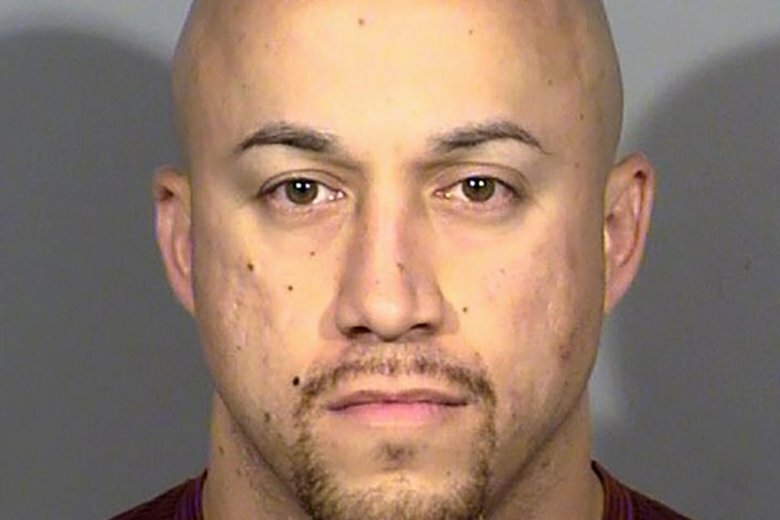 Lopera had become the first Las Vegas police officer to face a manslaughter charge since 1990 in a city where police shootings and uses of force drew reform recommendations in 2012 from the U.S. Justice Department’s Office of Community Oriented Policing Services. The charge against the officer came after the Clark County coroner ruled that Brown asphyxiated due to the police neck restraint. Medical examiners also noted that Brown had an enlarged heart and methamphetamine in his system when he died. All criminal charges against Lopera, also including oppression under color of office, were dropped last month after his police union legal representatives presented to a criminal grand jury evidence that Brown’s death was due to his heart ailment and drug use. The grand jury refused to indict. “Everybody on our side feels bad for the family,” police union executive Steve Grammas said Monday. He called the criminal case ended. A federal excessive force and wrongful death lawsuit on behalf of Brown’s children is pending. “I don’t think, whatever information is out there, they will be able to accept the loss of their family member,” Grammas said. A critic of the informal hearing system, former local American Civil Liberties Union chief Gary Peck, characterized the public proceeding as a “glorified press conference” designed to defuse public anger and community protests like those following Brown’s death. The proceeding, held in the Clark County Commission chambers, featured a summary of the case from a single police investigator under questioning by a county prosecutor and an ombudsman attorney appointed by the county manager to represent family interests. Brown was described as sweaty, agitated and disoriented when he approached Lopera and another patrol officer in a Venetian resort coffee shop. Brown said he thought someone was chasing him, and fled through employee hallways to a parking area behind the hotel. A video clip from Lopera’s body camera showed him chasing and catching Brown and using seven stun gun jolts, at least 12 punches and a neck restraint on Brown for more than a minute — even after a sergeant, Travis Crumrine, told him to let go. Lopera was recorded calling for Brown to stop as Brown approached the tailgate of a pickup truck, and the officer was later heard on the recording saying he thought Brown intended to commandeer the truck from the driver. Detective Trever Alsup, the case investigator, noted several times that Lopera has never provided sworn testimony about Brown’s death. District Attorney Steve Wolfson said 15 witnesses were invited to the proceeding but only Alsup agreed to speak. Attorney Craig Drummond, serving as hearing officer, chose 47 written public questions to answer from the 83 submitted by audience members. Drummond said the remaining 36 were irrelevant, repetitive or outside the scope of the hearing. Alsup said officers checked Brown several times over several minutes after he became unconscious before failing to find a pulse and beginning CPR. Farmer’s lawyer, Andre Lagomarsino, said he plans to ask the FBI for a criminal civil rights investigation.